Last week I didn't spend much time hooked up to the digital sewer pipe that is the internet. Instead, I spent a week in the Netherlands, ostensibly for the EUROCarbDB annual meeting, but in reality it was yet another excuse to meet up with the Glyco-cabal that I've been getting to know over the past 5 years, and chat over a few tasty Belgian beverages. We had our group meeting in a place called WageningenNetherlands. This place is known as the Life sciences city - a surprisingly accurate tag-line, since it's a largely drab city with a tiny social and entertainment district, and often smells of chicken and cow manure. On the upside, at least I didn't have to pay for being there. It was of course, good to meet up with the old crowd again - I keep running into Niclas all over the place, Tina was around, and I got some good time in with the other team members in EUROCarbDB. We had a pretty successful meeting, and in an uncharacteristic wellspring of optimism, I left thinking that the whole thing could actually work. A quick note about drugs in the Netherlands. For a country that's meant to be all liberal about drug usage, I saw hardly any people smoking in the country. It's not that smoking was banned in all these places - there were ashtrays at every single table I sat down at - but it just seems like people don't particularly like smoking. I'd like to say that's a clear message that prohibition and control doesn't work, but I think it's more of a sign that the Dutch care about their health too much. It must be all that bike riding that they do. 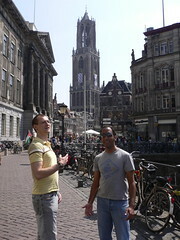 After spending time in Wageningen, Alessio and I stuck around in the Netherlands to hit Utrecht and Amsterdam. Joining us on our little adventure was Anita and Sarah - from HeidelbergDeutschland. Getting out from Wageningen, I found the rest of the Netherlands to be a much cooler place. I've been singing the praises of UtrechtNetherlands to anyone who will listen. Like my fawning over Gothenburg, Utrecht is a city with a really good atmosphere. It's primarily a student city, so walking around you see so much street art all over the place, it's a real feast for the eyes. Also - as Anita mentioned to me - although Heidelberg is a pretty town, it's more of a panoramic pretty town. All the good pictures of Heidelberg really need the castle or the old bridge in them. However, with Utrecht, you get the feeling that it's a bunch of really interesting smaller spaces. Spaces that reminded me of LondonUnited Kingdom 20 years ago. Walking around on the streets, amongst the buildings, I could have imagined myself riding my bike there. 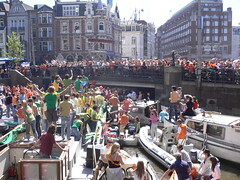 AmsterdamNetherlands is another city altogether. It's cool, and it's bizarre, and it's big. It's not my favourite place though. I didn't feel as immediately comfortable in Amsterdam as I did in Utrecht. The big issue was that I fell into a bit of a tourist trap there. You go and do all the touristy things, and you end up missing out on the real value in Amsterdam, which is their great subcultures and street art scenes. To get into that you really need to know someone who is not only living in the city, but also is into the scenes themselves. I guess Amsterdam is like Radiohead. Both are great, but you really need to spend a lot of time with them to fully appreciate their character. 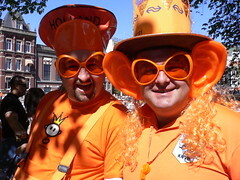 What you don't need time to get into is the Koninginnendag celebrations which were going on in the country on the 30th. The streets were filled with people, parties blasting out of every open window, and every second person with a turntable, massive speakers and stacks of wax. We spent a fair amount of time wandering the town, getting a feel for the whole thing. It's certainly an experience. The flea-markets during the day were pretty interesting, although I think you're better off going to Etsy to get your handcrafted goods. I ended up picking up a mid-century gas mask bag, along with a real life working gas mask to go with it. You never know, it might be useful some time in the future.